There’s been a lot of snobbery about some therapies to improve wellbeing in dementia. This snobbery I think comes in part from the idea held by some, particularly non-molecular biologists, that just because it doesn’t involve a PCR gel or test tubes, research can’t be any good. But I’ve never been failed to be struck about how actual persons with dementia have clearly been described substantial benefit in their quality of life, with not a Big Pharma product in site. In a 2009 study from the University of California, the human brain was imaged while people listened to music. That study found specific brain regions linked to autobiographical memories and emotions are activated by familiar music. The UC Davis study titled, “The Neural Architecture of Music-Evoked Autobiographical Memories,” was published in the journal Cerebral Cortex. That particular finding may help to explain why music can elicit strong responses from people with Alzheimer’s disease. The distributed neuronal network that the music activated is located in the medial prefrontal cortex region—right behind the forehead—and happens to be one of the last areas of the brain to atrophy over the course of Alzheimer’s disease. In a 2011 study, on a completely different continent, Finnish researchers used a groundbreaking method that allowed them to study how the brain processes different aspects of music, such as rhythm, tonality and timbre (sound colour) in a realistic listening situation. Their study was published in the journal NeuroImage. The researchers discovered that listening to music activates wide networks in the brain, including areas responsible for motor actions, emotions, and creativity. Their method of mapping revealed complex dynamics of brain networks and the way music affects us. For this study participants were scanned with functional Magnetic Resonance Imaging (fMRI) while listening to a stimulus with a rich musical structure, a modern Argentinian tango. Taken together, these findings suggest as if familiar music serves as a soundtrack for a mental movie that starts playing in our head. It calls back memories of a particular person or place, and you might all of a sudden see that person’s face in your mind’s eye. This might explain the phenomenon that some carers have noticed – that some people with dementia can start smiling when they hear a piece of music of particular significance to him or her. And indeed the issue about how music can bring back memories is certainly alive and well. Harry O’Donnell, a former Clyde welder and waterpolo player, has a type of dementia known as “vascular dementia”. After a period of illness, Harry and his wife Margaret were struggling to connect with each other. “Playlist for Life” worked with them both to identify a playlist that would evoke memories from Harry’s life. Margaret began sharing it with him on an iPod at every visit. “Playlist for Life” encourages families and caregivers to create for their loved one – at home or in residential care – a playlist of uniquely meaningful music delivered on an iPod whenever needed. (The original source of this video is here). There is accumulating evidence that if people with dementia are offered frequent access to the music in which their past experience and memories are embedded, it can improve their present mood, their awareness, their ability to understand and think and their sense of identity and independence. This strikingly is no matter how far their dementia has progressed. It might be also that music that is merely familiar in a general way, although pleasurable, is not likely to be so effective. This is an example of a wider body of work known as “reminiscence therapy”. Reminiscence therapy stimulates memory and conversation through the use of prompts –images, sounds, textures, tastes, and objects that spark the senses. Research shows that it can improves mood and quality of life. Reminiscence therapy typically uses prompts, such as photos, music or familiar items from the past, to encourage the person to talk about earlier memories. Since the late 1990s, partially controlled studies have shown that this treatment has a small but significant positive effect on mood, self-care, the ability to communicate and well-being. In some cases, this therapy improves intellectual functioning. The “House of Memories” programme demonstrates how a museum (or by association a library, arts centre, or theatre) can provide the health and social care sector with practical skills and knowledge to facilitate access to an untapped cultural resources; often within their locality. It is centered on the fantastic objects, archives and stories at the Museum of Liverpool and is delivered in partnership with a training provider, AFTA Thought. The programme provides social care staff, in domicile and residential settings, with the skills and resources they need to inform their practice and support people living with dementia. This powerful initiative aims to raise awareness of the condition, and enable participating professional health services, carers and families to help those directly affected to live well with dementia. Indeed “House of Memories” has had a profound impact in relation to the ‘culture of care’ across the three regions, which can be directly attributed to the strong empathic qualities and personal resonance inherent in the programme’s content, design and delivery. The evaluation has revealed a demonstrable shift in participants’ cognitive and emotional understanding of dementia and its implications for those directly affected and carers alike. Their training programme is designed to be easy to use and informative, acknowledging the central role the carer can play. They can help unlock the memory that is waiting to be shared, and provide a stimulating and rewarding experience for the person living with dementia. The programme provides participants (care workers, dementia champions, home care workers, agency support workers) with a variety of accessible practical experiences to introduce basic knowledge about the various forms of dementia, and to introduce memory activity resources linked to the museum experience, which can also be used within care settings. To extend the learning beyond the initial training experience, participants are also equipped with resources to take back into settings. These include a ‘memory box’, a ‘suitcase of memories’, and a ‘memory toolkit’. The power of memories in general life is undeniable. “Nothing is ever really lost to us as long as we remember it”, as L.M. Montgomery said in “The Story Girl”. 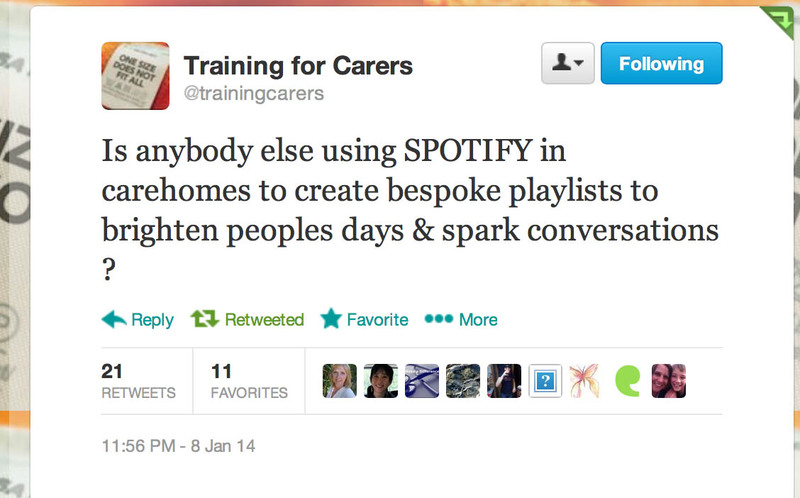 Thanks to @TommyNTour [Thomas Whitelaw] for sharing “Playlist for life”.